What is a personal design object library? In the world of computer programming, one of the key goals is to create and take advantage of “reusable code” to shorten the amount of time spent on a coding project. Little sub-routines that you create and compile and save to your library to use in the future. This time saving capability is part of Embrilliance StitchArtist L3. To wrap my mind about what type of designs I would put into my personal library, I thought about things that I created that I might reuse for multiple projects. In the hoop items such as key fobs, mug rugs, luggage tags are the first things that came to my mind and I’m sure you may have many other ideas. Your library will be created from a BE file that contains the separate designs that you want to be included in this particular library. This BE file is not going to be stitched so you don’t really care what the design page looks like. What is important is what you see in the Object Pane. In the picture on the left, you will see there are 4 designs.The names of the designs are set in the original BE that the library was created from. It doesn’t matter what the names are, those that like to be organized might have called them Inside1, Inside2 and Finishing1 Finishing2 to separate the inside quilting base from the final finishing stitches. There are no rules for naming. To the left is the BE file that was used to Create the Library from. 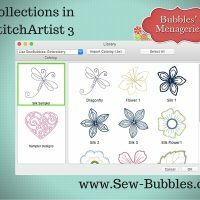 As a note, I created this BE file for my library by opening a new design page and choosing Merge Working File from the File menu and choosing the 2 in the hoop designs I had previously created in StitchArtist. 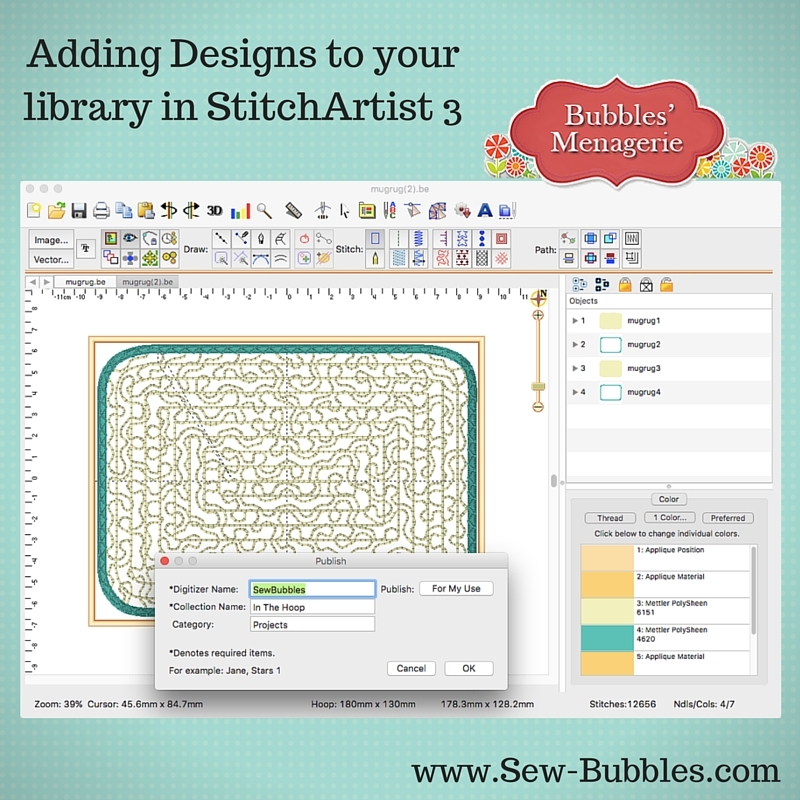 Your library can ONLY have designs YOU created in StitchArtist – you can NOT add PES or other stitch files. You can rename the designs in the object pane by selecting the name and typing a new name. You will want to do some “housekeeping” for your designs. I wanted to have the insides separate from the finishing stitches – they are all the same size and shape so I can mix and match. Every DESIGN has a disclosure triangle next to it and can have lots of objects. When you create your library, it will contain each DESIGN as a separate library object. So be sure that you use the Create > Design > Combine Design function if you need to tidy up your designs before you merge them into your library BE file for publishing. By the way – publishing designs to your library is usually done with tested designs that stitch the way you want. Think of publishing designs just like publishing a book – you’ve proofed and tested and edited and you are ready to go to print. Once you have your BE file set with your designs that you want to add to your library, go to Create > Publish > Designs and you will get the dialog to the left. Collection Name – this will be listed under each collection that you create. Category – The name you enter will be listed next to the digitizer name you have provided. The Category is an option for further organizing. 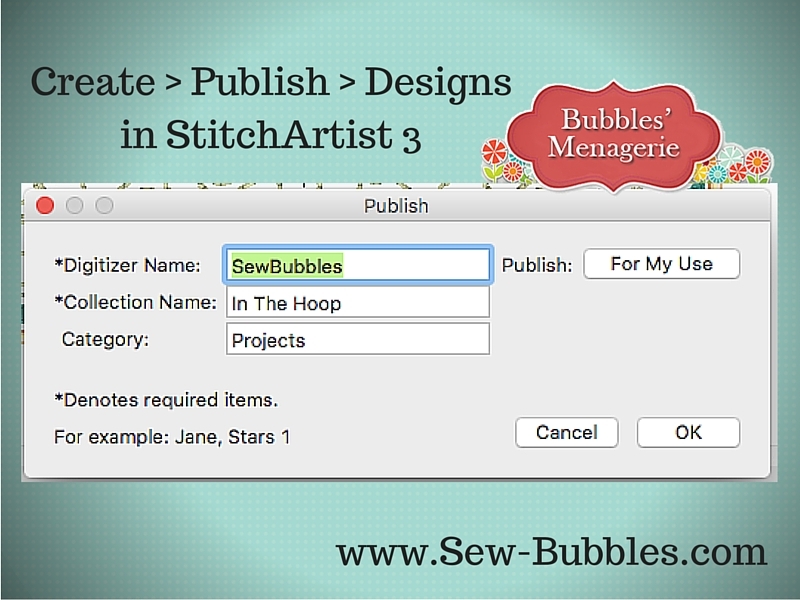 For example, I have a Projects Category – where I am creating a collection called In The Hoop. 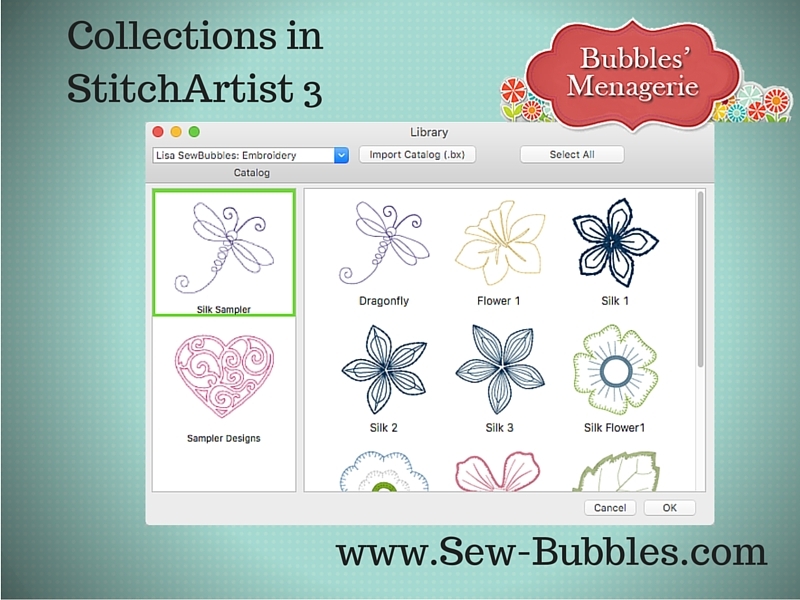 Then I have an Embroidery Category which has two collections – one called Silk Sampler and the second called Sampler Designs. So once you fill the dialog for publishing your designs, choose to Publish for my use. You will get the confirmation screen and you can click OK to close this dialog. 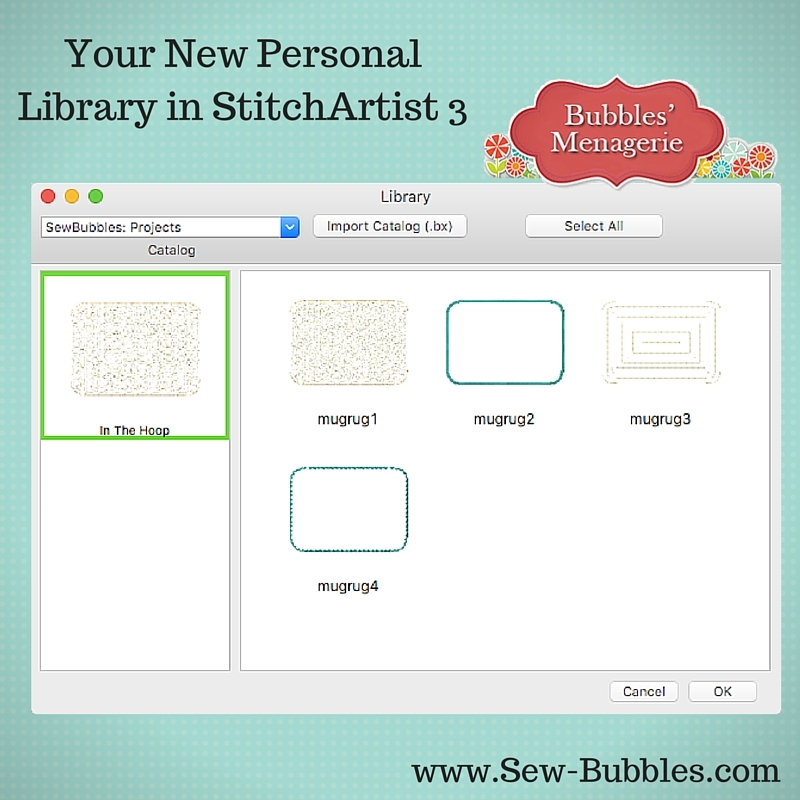 Now you can go to the Merge Library Design button and you will see your new library listed in the top pulldown menu. For more information about StitchArtist, please use my link here. For those interested in purchasing StitchArtist, you may contact me by email to see if I have a “show special” going on.